Welcome to Cedar Knoll Kennel. We are a small family-owned hobby kennel in beautiful Southern Minnesota. 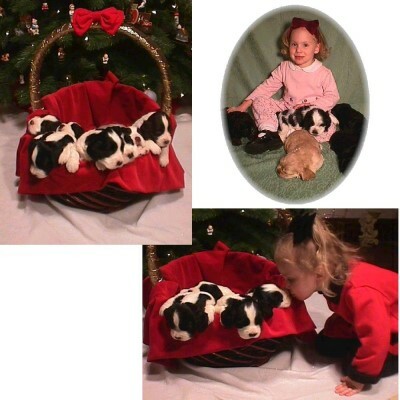 We raise field and field/bench purebred English Springer Spaniel puppies from champion bloodlines on country acreage about an hour south of the Twin Cities. Our dogs are AKC registered and have excellent temperaments. Our puppies are well-socialized by us and our children. If you're looking for a beautiful, intelligent, loving companion, you've come to the right place! Our puppies are healthy, vet checked, and come with a one-year health guarantee. We are experienced shippers and have placed our puppies throughout the United States, Canada and beyond with excellent results. Please give us a call at or . We are expecting our next litter before long. If you would like us to notify you when the puppies arrive, please contact us so that we can add your name to our notification list.